Click to visit the live tracker which updates every 8 seconds. The first step is creating a Tableau visualization that plots a point on a map using a parameter. This requires two parameters and two calculated fields. Create a new parameter called Lat and use the default floating format. Set the starting value at 39.123. Create a new parameter called Long and use the default floating format. Set the starting value at -84.51. Create a new calculated field Latitude and set it equal to the parameter [Lat]. Create a new calculated field Longitude and set it equal to the parameter [Long]. Right-click on Latitude and set the "geographic role" to Latitude. Right-click on Longitude and set the "geographic role" to Longitude. Place Longitude on Column and Latitude on Rows. You should now have a visualization that plots a point on a map in Cincinnati, Ohio. Pretty simple, right? Just two quick parameters and two calculated field. Now style the visualization as you wish and publish it to Tableau Public. Optional step: Find a Space Station icon to use as a custom shape. 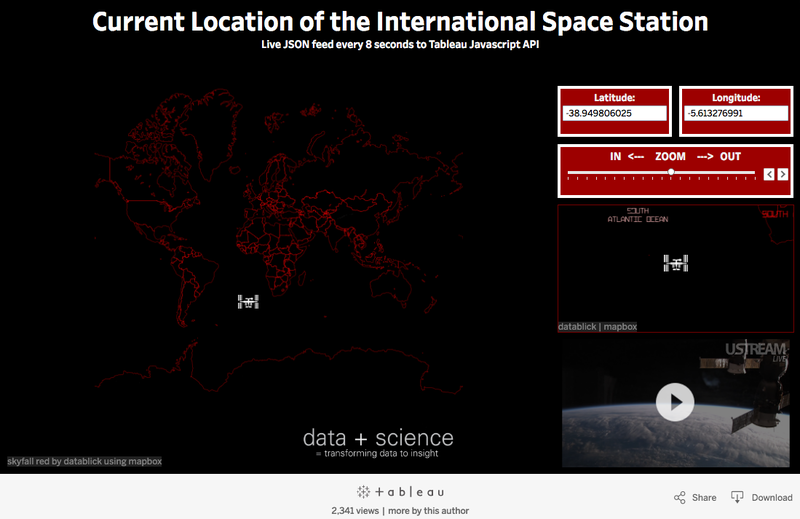 NASA maintains a live JSON feed that provides the current location of the International Space Station. Using a basic HTML page, the code below retrieves the latitude and longitude from this JSON feed and stores them in the variables Lat and Long. Note: Because of the 'jsonp,' it is very important that the Tableau function is called inside the GetValue function. onFirstInteractive sets up the workbook, and getValue is the functon we created above to get the very first reading of the latitude and longitude. I call the function so that the viz updates the ISS position immediately after it loads. var viz = new tableauSoftware.Viz(placeholderDiv, Url, options); puts all the pieces together for the JavasScript API using the variables that were just set (placeholderDiv, Url, options). I added window.setInterval("getValue()","8000"); which refreshes the browser every 8 seconds. The last step in the code above is creating a function that passes the parameters to a Tableau workbook. In step 1, we created two parameters in Tableau, one for Lat and one for Long. The function LatLong(a,b) creates a function that changes the workbook parameters using workbooka.changeParameterValueAsync("Lat", [a]); and workbooka.changeParameterValueAsync("Long", [b]);. Remember, this function is called above as the last line of code in the GetValue function. In other words, after the GetValue returns the latitude and longitude of the Space Station and holds them in variables, then it calls this functions to pass them to Tableau into the parameters that are set up. You now have all the code you need to control your viz. You can add some additional styling of the webpage background color and CSS styling of the viz as you see fit. Here's what the finished code looks like. I hope you find this information helpful. If you have any questions, feel free to email me at Jeff@DataPlusScience.com.